In 1997, LIUNA Vice President and Eastern Regional Manager Raymond M. Pocino founded the Laborers’ Eastern Region Organizing Fund (LEROF), the international’s first regional organizing fund. The LEROF team is dedicated to helping workers form and join the LIUNA and is committed to the protection and advancement of worker's rights. 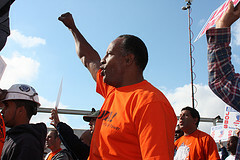 LEROF has engaged in some of the nation's most successful union organizing campaigns. LIUNA's strength lies in its idea that unions work—both for employees and employers. The power of LEROF rests in the skills and talents of members who actively participate in organizing campaigns—the 30 full-time organizers and the thousands of member volunteers who give their time and energy in support of their Union and workers everywhere. Are you or your colleagues being treated fairly at work? Are you asked to perform tasks that are hazardous to your health? Are you being denied pay for which you are entitled? Maybe it is time you have a Union working for you! LEROF can help.